Ken Coe advises business clients who represent a broad spectrum of industries and a wide range of business functions . Mr. Coe’s clients benefit from his ongoing working familiarity with various income, gift and estate tax matters, contracts of all kinds, shareholder, partnership agreements, limited liability company arrangements, real estate activities of all types and the purchase, sale and transfer of significant assets and the valuation issues and planning opportunities associated with those assets. Mr. Coe strives to take a sophisticated yet practical approach to the practice of law and the counsel and advice given to clients and their families. Mr. Coe works diligently to facilitate a client’s understanding of the approach being taken. In today’s environment of voluminous legal documentation, Mr. Coe believes that it is important for the client to know and understand the provisions and objectives of each document. As a member of Moore & Van Allen’s multi-faceted Wealth Transfer team, Mr. Coe is adept to sophisticated advanced tax planning techniques which he coordinates with team members and implements for clients on an ongoing basis. It is typical for many of Mr. Coe’s clients to own significant interests in real estate. Mr. Coe focuses on the potentially creative opportunities that real estate properties of all types offer for tax and business planning purposes. In addition to planning opportunities with real estate, he is also involved with the transactional real estate needs of clients, whether it is the purchase, sale, financing, leasing and/or development of the applicable real estate interests. Coe has been AV Top Rated Lawyer by Martinadale-Hubbell for more than 20 years. Coe has been actively utilizing limited partnerships and other pass-through entities (now predominantly limited liability companies) for business estate and tax planning purposes for more than 25 years. Coe has been serving as an arbitrator on the Commercial Panel of the American Arbitration Association since 1988. 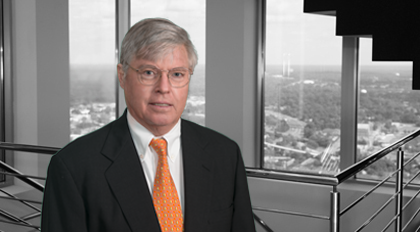 Having served on more than 60 occasions either as sole arbitrator or as a member of an arbitration panel throughout North and South Carolina and elsewhere in the Southeast, Coe’s experience as an arbitrator gives Coe a unique firsthand perspective on the consequences of “how and what can go wrong” in a business arrangement between third parties. Coe considers this a valuable asset in his ongoing counsel to clients on day to day matters as well as significant transactions.